DoesZenSleep Have Any Side Effects? Important Update: We regret to inform you that ZenSleep is officially out of business. The company is no longer processing orders and it is currently not planning a return to the market. We will keep an eye on future developments and post fresh updates in case of a change in the company’s status. ZenSleep 5-in-1 anti-snoring system includes products that are not designed to alleviate snoring problems. ZenMask and ZenPlugs can help improve sleep quality but do not provide snoring relief. The perceived effectiveness of ZenStrap, ZenGuard, and ZenVents significantly varies across users. Imagine waking up in a world where all of your snoring problems are simply gone. Snoring may not seem like a serious issue to some people, but the truth is that it can be an absolutely devastating condition to live with. Snoring leads to improper rest, poor quality of sleep, low daily energy, and even stress within your personal relationships. To put it simply, nobody wants to live with snoring. With that being said, countless companies are promising that their anti-snoring products are the best and the only ones that work! It can be hard to trust all of these faceless companies, so we decided to take a close look at one of the most popular anti-snoring systems for ourselves: ZenSleep. This product is ranked #3 on our Best Tongue Retaining Devices list. When you struggle with snoring, there are only so many courses of action that you can take in order to address it. You can talk to a medical professional regarding potential surgery options. You can spend exorbitant amounts of money on special pillows, beds, and CPAP machines. You can also purchase anti-snoring devices on the Internet. On the web, there are tons of different kinds of anti-snoring products available to you. Products like tongue stabilizing devices target your tongue while mandibular advancement devices (an oral mouthpiece) focus on adjusting your jaw. You’ll even see special chinstraps and nasal vents that are additionally created to help with your snoring problem. With so many different options available to you, how in the world are you supposed to pick? The answer? You don’t. You get them all with your ZenSleepanti-snoring system. ZenSleep is a specially designed, all-in-one anti-snoring bundle that focuses on giving you the products that you need in order to address the snoring that has been so problematic in your day-to-day and night-to-night life. ZenSleep is made up of five quality products and each of them addresses a different aspect of your snoring. You have your ZenGuard, ZenStrap, ZenVents, ZenMask, and ZenPlugs. Supposedly, with this entire system at your disposal, you will be able to immediately put an end to your snoring forever. If you want to learn more about the ZenSleep sleep system, let’s continue on to our product breakdown. Next up in our ZenSleep review, we’ll be focusing on separating each individual aspect of the ZenSleep system so that you can understand what products you are getting and what they can do for you. We are going to start our ZenSleep review by discussing the first product on the list: ZenVents. Knowing that this anti-snoring sleep system is a five-part product, we want to make sure that you understand each and every component. ZenVents were designed to attack your snoring by addressing the problem within your nose. Most anti-snoring devices are of the traditional mouthpiece sort, where they intend to approach the problem of snoring by addressing your larynx. ZenSleep is a complete system, so it attacks the nose with ZenVents. With ZenVents, users implant a special nasal maximizing airflow device into their nose. The goal with ZenVents is simple: to address nasal snoring that is a result of congestion or allergies or something of the like. ZenVents improve your airflow in your nose by dilating the passageways within. ZenVents are the first part of the ZenSleep sleep system, but they may end up being the most important part for many people. HOW TO USE – With ZenVents, there is almost no real preparation. All that you need to do is practice routine hygiene by maintaining and regularly washing your ZenVents with antibacterial soap. At night, before going to bed, merely insert your ZenVents into your nose until they are comfortably installed. The feeling might be odd at first, but most customers find that they acclimate to the product fairly quickly. POTENTIAL SIDE EFFECTS – If you haven’t ever used nasal anti-snoring devices, then you are likely unsure of how they treat you. Unlike your mouth, you aren’t traditionally used to putting things up your nose. With that being said, ZenVents don’t really offer too much in the way of side effects. Still, for the sake of clarity, we should list the most frequent side effects that users experience with ZenVents. Slight Nasal Discomfort – Made of silicon, ZenVents can feel too ‘hard’ for people to comfortably sleep with them. If your ZenVents are irritating your nose, consider taking them out and using a different part of the ZenSleep system. Nightly Displacement – ZenVents are small products and, as such, they can occasionally come displaced from your nose while you sleep. If you struggle with nasal congestion or other nasal-related snoring issues, ZenVents is a great product for you. You can use ZenVents in conjunction with the anti-snoring mouthpiece, ZenGuard, or you can wear it alone. Next up in our ZenSleep review, we come to the ZenStrap. When you add ZenStrap to your sleeping system, you are getting a product that is designed to address problems with snoring related to your jaw. Anti-snoring chinstraps are actually one of the more common anti-snoring devices available on the Internet so it makes sense that one has been added to ZenSleep’s complete anti-snoring sleep system. ZenSystem looks like any other anti-snoring chinstrap and it addresses your issues in the simplest way possible – by attacking the mechanical properties of your jaw. Chinstraps like ZenStrap work like a harness, going around your chin in order to keep your mouth in a certain position so as to eliminate snoring. HOW TO USE – With ZenStrap, you couldn’t have an easier start to your anti-snoring system. You put ZenStrap on by placing your chin into the bottom loop. The rest of the system rounds about your head with your ears being placed within the side vents. ZenStrap also features adjustable straps so that you can pull the device tight enough to fit your needs. ZenStrap can be used right alongside your oral anti-snoring devices, like ZenGuard, and with your anti-snoring nasal devices, like ZenVents. POTENTIAL SIDE EFFECTS – With ZenStrap, there are very few potential side effects that you have to be worried about. Chinstrap anti-snoring products are as effective and simple to use as they are safe. There are no potential side effects to list, but people with bushy beards may have trouble wearing the product. When it comes to ZenSleep, the approach to addressing your snoring is exhaustive. The makers of the product wanted to address every aspect of your nightly routine and that includes addressing potential light pollution during your rest. ZenMask is a comfortable blackout mask that was designed to be used in conjunction with the other products inside of the system. HOW TO USE – ZenMask is as simple to use as it is comfortable. This product is made of soft fabric and it features an adjustable strap so that you can cater the mask to the size and shape of your face. The domed eye fittings prevent any sort of pressure from impacting your rest and the dark cloth works to completely block out the light. Being able to fall into a comfortable sleep quickly is immensely valuable as you no doubt understand. POTENTIAL SIDE EFFECTS – ZenMask is another part of ZenSleep that doesn’t have any real side effects to be made aware of. Sleep masks are pretty simple and completely safe to use. The only complaint that seemed to be repeated regarding ZenMask was that the straps were slightly uncomfortable if you did not secure them correctly. Finally, there were mixed reports regarding the strength and durability of the straps themselves. Sleeping masks are an easy way to improve the quality of your night’s rest. It can be hard to understand just how much light pollution can impact your rest. When you struggle with snoring, you know that any bit of discomfort can lead to an episode of snoring. We spoke about the importance of controlling the light in your environment while you are at rest. The same can be said of controlling your sound. ZenSleep focuses on giving you the tools to address problems in your sleep routine on every level. With ZenPlugs, the focus is on controlling any and all audio pollution that might otherwise disturb you. HOW TO USE – ZenPlugs are a simple set of triple-flanged earplugs. These little silicone devices are meant to tread the line between comfort and complete noise reduction. What makes ZenPlugs particularly alluring in comparison to other earplugs on the market is that they are designed with longevity and reusability in mind. You won’t be using ZenPlugs once and then tossing them out. Additionally, ZenPlugs adjusts to your ear size and as such can work for just about anyone. All you have to do is pinch the bottom of your ZenPlugs before inserting them into your ear, allowing them to expand to your ear canal. POTENTIAL SIDE EFFECTS -Earplugs don’t typically manifest many potential side effects and we’re grateful to say that this trend continues with ZenPlugs. ZenPlugs have, at worst, been considered slightly uncomfortable by people who are not used to wearing earplugs to bed. Additionally, some users claim that the earplugs are not quite as noise-canceling as they had been led to believe. The crowning jewel of ZenSleep anti-snoring system’s technology is the product known as ZenGuard. ZenGuard is what we call a tongue stabilizing device, which basically means that it helps your snoring by attacking the problem at its core: your larynx as related to your tongue. Tongue stabilizing devices or TSD are a unique turn on oral anti-snoring technology in that they can work to immediately relegate your snoring to the past. Tongue snoring devices are different than mandibular advancement devices in a number of different ways and they should not be confused with one another. They both attack snoring by doing different things. HOW TO USE – We’re going to go into the actual fitting process of ZenGuard at a later point in our ZenSleep review, but we still want to go over the broad strokes of the product while we have you listening. With ZenGuard, you attack your snoring by putting the product into your mouth while you sleep at night. Picking up ZenGuard, you’ll notice that there is an opening in the middle of the TSD. You slowly feed your tongue into that opening before squeezing the little ‘bubble’ on the other side, thus pulling out any excess air. With your tongue stabilized, you stand a chance at getting rid of your snoring forever. The art of snoring, if we can call it that, has everything to do with your tongue and the muscles in your throat. When you sleep, your muscles relax and this causes your tongue to collapse toward the back of your mouth. When your tongue begins to obstruct your airway, you create what we know as snoring. This is also similar to the mechanics of sleep apnea, so ZenGuard can be used to attack that sleep disorder as well. Tongue Soreness – The most common side effect of a tongue stabilizing device is tongue soreness. Some users report feeling slight soreness or ‘fatigue’ in the tongue when they first begin using ZenGuard. Excess Salivation – Additionally, some users report that they experience an uptake in salivation and drooling while using the device. This side effect typically abates with continued use. ZenGuard was designed to be used by anyone with snoring problems. The fact that it can address other issues, like sleep apnea, is just the cherry on top of the ice cream. ZenGuard works to fix your snoring by addressing your tongue directly, thus bringing about the most instantaneous effect against your snoring woes. ZenGuard is the final piece of ZenSleep and it is by far the most effective. Alright, so we outlined the different products available in ZenSleep. Now, we have to talk a little bit about how the system actually works in order to address your snoring problems. When you go to sleep at night, you need to be as relaxed and ready to rest as possible. When your sleep is disrupted, the quality of your rest diminishes and this results in a complete degradation of the rest of your night and following day. ZenSleep works by addressing snoring problems as a complete system instead of individually. Typically, if you were to purchase an anti-snoring device, you would likely just use that singular device. Let’s say that you buy an anti-snoring mouthpiece. You likely will only use the mouthpiece and thus lose the benefits that other aspects of anti-snoring control can address. With ZenSleep, you are addressing: light and noise pollution, nasal-related snoring problems, oral-related snoring problems, and even jaw placement. You don’t have to be a sleep expert to understand that covering more of your bases can only be a good thing, particularly with a systemic problem like snoring. If you want to attack snoring where it counts, ZenSleep can be the product to help you out. What we love most about ZenSleep as a system is that it is relatively simple to use and easy to get going when you first acquire the products. Still, that doesn’t mean that all products in ZenSleep are equally easy to use. By far, customers have the most questions concerning ZenGuard. ZenGuard is a tongue stabilizing device (TSD) and that can throw people off at first. ZenGuard looks a little bit like a pacifier and it operates in the same way. Let’s break down how to use ZenGuard so that you don’t have anything to worry about. Start by taking ZenGuard and rinsing it off with hot water and toothpaste. You want your mouth and yourZenGuard to be clean on first use. Now, your first test with ZenGuard should be well before you go to bed. You want to get used to wearing it for short periods of time before sleeping with the device. Take ZenGuard and line it up outside of your mouth. The notched ridge on the base should be facing down for alignment purposes. With ZenGuard properly lined up, feed your tongue slowly through the opening. Squeeze the ‘bulb’ gently in order to set the ‘pressure’ of the bulb. Rest your tongue comfortably inside of the bulb and wear the product for an hour or two at a time. Get used to how it feels before sleeping with the product. ZenGuard is an extremely easy product to use, but you still have to pay attention to the few simple steps that we outlined above. Take time with ZenGuard in order to maximize its effectiveness and don’t be concerned if you have trouble getting comfortable with it at first, everyone does. Once you are acclimated, ZenGuard becomes an indispensable product in your anti-snoring crusade. ZenSleep wouldn’t be much of an anti-snoring system if it didn’t work to get rid of snoring, would it? Thankfully, anti-snoring is the name of the game for ZenSleep and the product plays the game well. ZenSleep works by offering you a well-rounded approach to snoring by addressing it on every single level. Getting control of the above problems can be the first step toward helping to solve your snoring internally. While you address those issues, however, you should rely on ZenSleep to address the physical manifestations of the problem. Sleep apnea is a sleeping disorder that is quite common and more severe than traditional snoring. With sleep apnea, your snoring is a result of a physical obstruction in the passageway of your throat. Sleep apnea is more serious than just snoring, but it can be treated with some of the same technology. If you are capable of breathing out of your nose and if your sleep apnea is mild, then ZenGuard can be used to attack your sleep apnea. ZenGuard is probably the most effective tool in ZenSleep’s toolbox for addressing sleep apnea, but the other products work as well. If you have severe sleep apnea, then you should consider seeking advice from a medical professional. Sleep apnea can be treated by products such as ZenSleep, but severe forms of sleep apnea may only be managed with the use of a CPAP machine. When dealing with snoring, you are going to be trying out a bunch of different products in order to find the solution that works for you. With any luck, ZenSleep will work to address and cure your snoring with little other fanfare. However, as said above, ZenSleep products do create some minimal side effects depending on the product. Traditionally, the side effects that you experience with ZenSleep are going to be relatively minor and constrained to just the ZenGuard mouthpiece. Minor side effects include salivation and jaw and tongue soreness. Side effects traditionally only impact a small percentage of users and tend to dissipate with continued use. If your side effects do not abate, consider stopping the use of the product and contacting ZenSleep for a refund. ZenSleep is an ideal anti-snoring system for people who want to attack snoring in as exhaustive a way as possible. If you are a chronic snorer or someone with a mild to moderate sleep apnea, then we advise putting ZenSleep on your radar. The best thing about ZenSleep is that it offers a multi-pronged approach to eliminating snoring, which makes it easy to use if you have any kind of limitations. For example, if you are a mouth breather, then products like ZenGuard won’t work as well. If you are a nose breather, then ZenVents won’t be as effective. Why do we mention this? Because ZenSleep provides solutions for every kind of breather and sleeper. In order to get a full understanding of ZenSleep, we feel that it is important to share reviews from other customers. We want to take a moment to outline both the compliments and complaints related to ZenSleep. Compliments – Users fell in love with how affordable ZenSleep is as a packaged product. Users also enjoyed the buy-one-get-one option because it allowed them to address their snoring for a long time. We found many customers who enjoyed the well-rounded approach to addressing snoring as a whole. The systemic approach was popular with almost every positive review of the system, with ZenGuard gaining the highest marks of the bunch of products. Complaints – The most common complaints related to ZenSleep were relatively minor and simple. 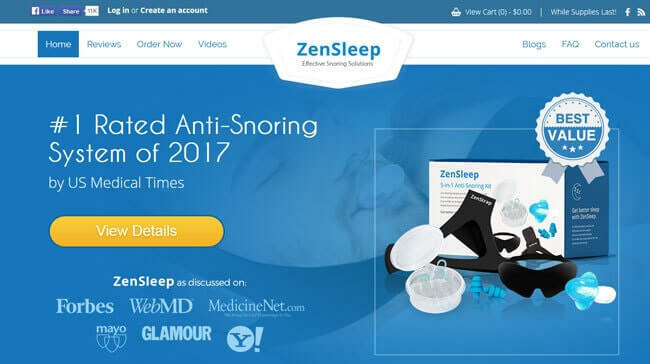 Users felt that individual products didn’t do much to address their snoring, with ZenMasks and ZenPlugs being the most commonly disliked products. Some users found minor side effects with ZenVents that didn’t go away with use. ZenSleep as a system seems to be one of the more effective anti-snoring products around. The lack of appreciable side effects and the minor impact of the relatively few side effects are also something to appreciate. As with most anti-snoring products, ZenSleep offers users a little bit of flexibility in relation to returning or refunding their product. Anti-snoring technology is so fickle that it can be hard to find the right product for your snoring problems. As such, we always appreciate a company that is willing to extend a generous return policy. ZenSleep offers a 90-day return policy. In order to refund your ZenSleep system, you must have the product brochure as well as every item in the system. You will not be given a complete refund as ZenSleep will charge shipping and handling fees as well as a waste disposal fee due to the fact that these products cannot be resold. ZenSystem can be purchased piece by piece or it can be purchased as an all in one system. We’ll list all the pricing options below so that you can have a full understanding of the pricing. ZenSleep Stop Snoring System – $149 – Buy one and get one free! Right now, ZenSleep is being offered as a 2 for 1 package. Get two of every product for one single price. ZenGuard TSD Mouthpiece – $97 – If you just want a single ZenGuard mouthpiece, you’ll pay quite the premium. You get additional discounts when you add multiple mouthpieces to your order. ZenStrap Chinstrap – $79 – You get one single ZenStrap. ZenVents – $49 – In order to attack your snoring from the perspective of your nose, you should opt for this product. ZenMask – $39 – If you want a blackout sleep mask that helps you with snoring, this is the product for you. ZenPlugs – $29 – Get your pair of re-usable, triple-flanged earplugs for one singular low price. If you are still unsure if ZenSleep is right for you, check out the key advantages and flaws of this snoring aid. At the end of the day, products like ZenSleep work to give you back your night’s rest by addressing all of the problems that could be leading to your snoring problems. ZenSleep works as a complete system in order to treat the mechanics of snoring so that you can get back your rest and the quality of life that you deserve. While ZenSleep isn’t perfect, the system offers enough solutions that you’ll no doubt find some answers to your snoring problems. Our ratings are the result of an objective and independent evaluation of ZenSleep, generating the final rating that reflects the overall quality of the company. Ratings may change as the product introduces changes. ZenSleep user rating based on 27 user reviews. My husband bought the ZenGuard because of his excessive snoring, & figuring it would be a lot less costly than a CPap machine. The cost still of $73.?? was much better than a few hundred dollars as most of those machine run people. His device was due to come w/ 2 mouth pieces but when it finally arrived there was only 1. It was delivered on Aug. 10, 2018 so I called ZenSleep w/ the # they provided on Aug 11 to let them know their mistake. Figuring they’d rectify the issue immediately and send one more like promised when he ordered. When you call it seems as if you’ll talk to a live agent but then a VM comes on for you to leave a msg. A msg where someone is supposed to call you back momentarily but your msg NEVER gets returned. As of today, I’ve called 11 times and left about 7 msgs. I’ve since called the BBB and reported them as well. I truly wish my husband would have seen these reviews before wanting this product not only because he wouldn’t have bought thru this horrible company but you can buy the same item for under $20 . Don’t waste your time w/ a company who clearly doesn’t honor their return policy let alone are very unprofessional in how they handle their business and treat their customers who are clearly in need of help. However, this company is most professional at only being great thieves & scammers. Total SCUMBAGS!!! The mouthpiece reduced my snoring, so I didn't need to buy the entire system. You don't need all 5 parts. Try the mouthpiece or chinstrap. I can't see how vents can help anyone. And the mask and plugs, that's just a waste of money. I was intrigued by the very concept of ZenSleep, getting 5 products for a decent price, and I was desperate enough that I wanted to try all possible solutions for my horrible, embarassing, stupid snoring problem. The mouthpiece worked fine, but I just can't sleep with something in my mouth, it's just impossible. So I tried the strap next (combined it with the mask, just to be more comfortable at night), and it has helped a lot. My snoring is not completely gone, but it's much more tolerable, at least that's what my husband says. Zensleep works for me. I'm sorry to see so many people had bad experiences with it, but the product is not a scam. It's the only snoring aid that worked for me and I tried a lot of them. I bought the entire pack, with the plugs and mask and all (plugs and mask for the wife obviously), and ended up needing only the mouthpiece, so my recommendation is to try the mouthpiece only (or combine it with the strap if you're a heavy snorer), and see what happens from there. BEWARE ZenSleep Does Not Honor Their Quarantee edubI bought ZenSleep in April, 2018, I tried everything, but the mouth guard would not stay suctioned to my tongue. As I told Zen Sleep, I really wanted this to work, but I tried. So I followed all of their rules to get a refund. You are required to get a RTA# from them. You have to put that on your return package. It took them forever to send me the #. I packaged everything up as they requested, wrote RTA# on the outside of the package, sent it Registered mail through the US Postal Service, so that I could follow it. They received on a Monday May 5th, 2018 at 10:20am. I sent many emails requesting my refund. Finally on June 3, 2018 I received an email from Zen Sleep stating that I would receive my full refund. It never came. After sending over a fifty emails asking where it was? I noticed on the refund statement it had written “Stripe connect” so I looked it up and it is a company that handles credit card payments and refunds. I callrd them and they say they never got anything from ZenSleep to refund my money. ZenSleep won’t answer any of my emails. I’m guessing I will need to take legal action. I had hoped to avoid that. ZenSleep is not truthful. They do not honor their quarantee!!!! Thanks for the review, but all you need to do is contact your CC company and file a dispute, they will refund your money and open a claim against the vendor. I have already threatened them with that action if they continue to try and string me out as I am finding the same issue with trying to return the product. Instead of giving me the "RMA#" upon my request, they wanted me to explain why I didn't like it, how long it tried it etc... I told them that it sucked literally and it made me gag when putting my toungue far enough inside to device for it to stay on. Then I got an e-mail that they would give me the RMA# within 24 hours which I have yet to receive 2 days later. My kids would shut my bedroom door and my wife sometimes picked up and moved at night to the guest bedroom because I have a chain saw going on with my snoring. I bought this device(2 for 1, didn't really need to unless the product wears out) and it works. I used the zengaurd, Your tongue is sore for the first 3 to 4 days until you figure out the amount of suction. The first night and onward I have been snoreless. I'm going to try the head strap too, I bought the kit so why not. Only reason I rated it a 4 was the 2 for 1 sale gimmick, 2 for 1 should only be bought if you have 2 snorers as the product retails for $75 regularly. I saw the customer complaints on returns and was concerned but I suspect in this business you have people trying multiple solutions and sending back products they are not happy with. I guess I was lucky, mine worked. This company is a complete ripoff. Check with the Scottsdale Arizona BBB website before you waste your money. They have a phone they don't answer, an email form they don't respond to, and a guarantee they won't honor. My husband hated the idea of this product and never tried it. It took me several attempts to get an RMA number from the company to return the product. The response I received seemed automated--Jill T. I returned the product over two weeks ago and have USPS confirmation of delivery but have not received a refund nor have they responded to my inquiries about it. Their customer service line is NEVER available. This company is horrible. I made a complaint to the BBB--I am one of many. Beware dealing with these scammers. They have a customer service # that never gets answered, an e-mail form that never gets replied to, and just buying their product isn't good enough, they trick you into additional charges you've not agreed to! In my case, "get one free" apparently means I'm gonna charge you an extra 79.00. Do yourself a favor and just Don't! Zensleep is definitely a do not waste your time product! Bought it, got it, and actually got an RMA number from them, To me but that is where their customer service ends. I even sent them proof that they had actually received the product back with no response. Please do not waste your hard earned money on a product that is so shoddy and the customer service is even worse. I wish I had read these reviews prior to purchasing the zen sleep multi-pack. I tried using the ZenGuard during the day as the instructions suggested, and then again during the night. The product is not for me - I can't sleep with my tongue sticking out of my mouth, so I decided to request a Return Merchandise Authorization, using the exact instructions given on the packing slip. I was way inside the 90 day return window. It's been a week, and I've gotten no response to my several emails, and when I tried to call, I got a message saying no reps were available at this time. I think that for some people, this could be a great product, but it just wasn't for me. So, purchase at your own risk! Absolutely miserable customer service. I tried using this device for a month and extremely uncomfortable. Disrupted sleep until about 4 or 5:00 am when I would pull it out so I could actually sleep. Emailed customer service so I could get authorization to send it back and instead of an authorization I got a bunch of questions. What does 100% guarantee mean to these people!!!!???? I sent the request on March 3rd, they replied on March 6th with all their questions (and no return authorization number). I actually answered all their questions by return email right away and here we are .....8 days later 3/14/2018 , no return authorizatuion number, no reply, NOTHING!!! I am being complately ignored now. I tried Good Morning Snore Solution several months ago. Could not tolerate because that device does not have any protection for your tongue. When I found ZenSleep, I thought it might work as it has a a sleeve that protects your tongue from your teeth. I really wanted it to work but I think the fact that it seems much larger than Good Morning Snore Solution it is just too big for my mouth. The Good Morning Snore company has OUTSTANDING service. Immediately sent me a return authorization, shipping address label and followed up after I had my money back to make sure I got my refund. Good Morning Snore Solution will probably be in business a long time as they honor THEIR guarantee! In good faith I paid for a product the anti snoring pillow that was offered to me in an email. This was in Sept 2017. As I did not receive the product, in February 2018 I requested a refund. I was told in a number of on line Chats that the finance department was notified and my refund would be processed. "Wait for an email to confirm". The email never came. I have not been notified of a refund I have not received a refund. Beware of this company. I don’t understand people complaining about getting 5 devices for the price of 1. Come on, people, it’s meant to help you figure out what works best for you, so you don’t have to spend money on more devices. I use zenguard and it’s not perfect, but it’s better than other mouthguards I’ve tried. Why is everyone just talking about customer support? I mean, I understand the frustration, but people want to know whether the devices work, and yes, they do. The plugs are useless, the strap is good, the mask is fine, it’s just a mask, the mouthguard is too uncomfortable. Didn’t use the vents. I have sleep apnea and ordered the kit thinking that if the product didn't work for me I could return it within 90 days. When I received the product I decided not to open the pkg (I have moderate sleep apnea and probably wouldn't work for me). I called Zen Sleep several times and amazingly I got a human being who gave me a return authorization #. I later noticed they never give a full refund and charge a 25% restocking fee. I have tried to call and email to ask whether they would charge the fee if the pkg was unopened. I have trued numerous times since Jan. 19th and never received any response. Now I think that of I return the product even with the RA # I won't get my refund. THIS COMPANY IS HORRIBLE! DO NOT PURCHASE FROM THEM! Zen sleep product itself helps. However, I accidentally ordered two products and their customer service is terrible. Zen does not answer emails, phone calls nor do they honor the return policy. The policy states one needs to contact them for an Return "number" but Zen makes a point to never return your phone call or email (I have left several messages and sent several emails!) Yet they have no problem sending automated emails asking your evaluation of the product. The pricing is "all over the board" if one does some research. I recommend looking for the same type of product with a different company. Terrible (really terrible) customer service. They do not honor their return policy. The policy says to contact them for an RMA number to return. However, they do not answer calls nor emails! (I have sent several). The product is okay but research proves the pricing varies. I would highly recommend NOT buying from Zen but to look for similar products somewhere else. Zensleep has horrible customer service. They do not contact you back if it is regarding a refund. They do not honor their return policy and refund your money. Read the return policy before ordering. In order to return the product must be unused and still in the packaging. I would not recommend ordering from this company. The strap worked perfectly for me and my wife is using the mask because she likes to sleep in late on weekends. We couldn’t be happier. I am thinking of giving the other stuff as gifts to my friends, since I didn’t use them and it is obviously working. Hated ZenGuard and the other products didn’t work for me. I have all kinds of allergies so ZenVents were a great discovery. I just wish I hadn’t spent the money on the entire kit, since I only use the vents and the sleeping mask. Bought the kit for my husband, he tried it all and only ZenGuard seems to work, but he really doesn’t like wearing it. We found 0 verified ZenSleep discounts for April, 2019.